Leicester City’s Nigerian midfielder Wilfred Ndidi (L) celebrates after scoring during the English Premier League football match between Leicester City and Southampton at King Power Stadium in Leicester, central England on January 12, 2019. The Saints held on to their lead despite spending the entire second half with 10 men. James Ward-Prowse gave Southampton an early lead from the penalty spot after Shane Long was bundled over in the area by Nampalys Mendy. Saints defender Yan Valery was then shown a second yellow card for a foul on Marc Albrighton but Long doubled their lead just before half-time. 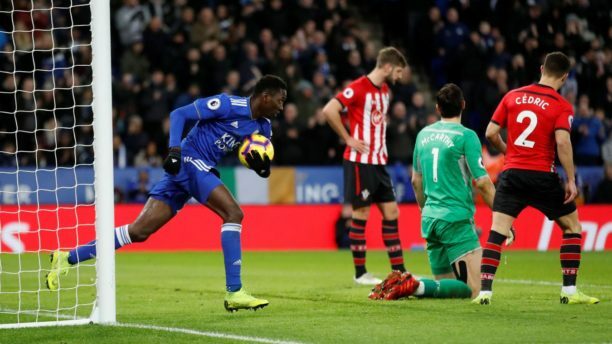 Ndidi scrambled home Ricardo Pereira’s cross to bring Leicester back into the game at the start of the second half, but Southampton held on for a priceless victory.